Going on a camping holiday with your family or friends is a fun, memory-worthy event. But if you’re like most families, whether your kids are little or teenagers, you’re bound to hear the dreaded, ‘I’m bored’ at some point during the trip. That’s why we’ve put together a list of camping games that will chase that boredom away—and the adults might even enjoy themselves too! We wanted to make sure that these fun camping games aren’t just for athletic or nature-loving kids. So we pulled together ideas that will appeal to any kids, teenagers or adults. This family camping games list is geared for everyone! This camping game can be modified for any age. Since you’re camping, it makes sense to focus on gathering things in nature from leaves to sticks to harder-to-find items like certain bugs or flowers. We suggest pairing up, so perhaps an older sibling with younger sibling or an adult with a younger kid and older kids paired up together. This family camping game will work either when you’re at the campsite (you can change up what they need to find) or while on a hike in the Byron Bay area. If you’re really planning ahead, you could research a walk ahead of time, such as the Cape Byron walking trail that goes around the famous Byron Bay Lighthouse. However, if you’re looking for a more generic hunt, then try out this one that includes pictures for those kids with you who can’t read yet. You can have everyone collect items, check them off or even go a little techy and take pictures on their phones. If you have younger kids with you on your camping holiday, then this version of the alphabet game is a fun one! You can play this camping game for kids either at the campsite or even when you’re on a hike or walking around Byron Bay’s town centre doing some shopping. The kids just need to find and either write down or point out objects or signs that start with the letter, going from A to Z. The first one to Z wins! Fun for the whole family is guaranteed with these camping games. Create a set of games from relay races and swimming competitions to puzzles and finding the longest stick. The beauty of this Olympics is you can change up the competitions based on the age level and athletic skills of your group. Keep in mind, if you’re staying at the Broken Head Holiday Park, there’s a beach right there as well as a nearby park that can host the “Olympics” or at least be part of the events. The Olympics works just as well as camping games for adults—change up the competitions and have a blast! Family camping games that work for any age and don’t require any pre-planning are excellent ideas to keep in mind for your next camping holiday. Kids, teenagers, parents, grandparents—truly anyone—can get in on the fun with this one. Hanging out in the evening, suggest that everyone tell a story; it can be scary, funny, true, made up, whatever works. It’ll be a blast to hear what your littles come up with, and the kids will love listening to their parents tell a tale. If you happen to be a competitive family, then you can always add in voting for a favourite and even keep it going during the whole stay to see who has the most wins! Teenagers can be a hard group to tear away from their devices, but games like this could be fun for them too. All you need is a ball to play this game. Everyone stands in a circle except for one player who is in the middle with the ball. The player in the middle goes around the circle saying “catch” or “don’t catch” and throwing the ball. Like the children’s game, Simon Says, if a player catches the ball when told not to or the other way around, that player is out. This version of ring toss could be fun for young and old. Pick up glow-in-the-dark rings and sticks, which you can find for cheap at most discount stores, and you can set up your game as soon as the sun sets. It’ll be fun to see who can do the best! While this probably won’t work for families with small children, this camping game would be great for families with kids ages 5 and up. An easy game to play in the evening after dinner or during some down time, charades doesn’t involve more than slips of paper with what each person needs to act out, all placed in a bowl or even a cup. Plan ahead and use these free printables to have the game all ready to go when you arrive at camp. This classic game is an easy way to pass some downtime at camp—perhaps while the kids wait for dinner to be made or as parents set up tents. If you don’t know how to play, follow these directions. This memory game works for both kids and adults. This camping game can be played in several variations. Noah’s Ark involves naming animals in alphabetical order that you’re taking on the ark. For example, “I’m going on Noah’s Ark and I’m taking two aardvarks.” The next person repeats what the first person is bringing and adds to it by using the next letter. And so on. Another variation is, “I’m going on a trip and I’m taking X.” Again, whatever you are taking goes in alphabetical order. When a person can’t remember the order and items, then that person loses, and it continues until the winner is the only person left. Yet another game that can appeal to all ages. Download and print these cards for however many people you’ll have. Then put the items on slips of paper and dump them in a bowl. Grab some coins or other items on hand to cover up the items called out that you have on your card. And you’re ready to get playing! Adult sidebar: Rather than Bingo, if you just have adults on this trip or perhaps after kiddos head to bed, you might pull out Cards Against Humanity. (You’ll see later that we advise against traditional board games unless in an enclosed camper, but this is just cards so easier to play on a picnic table or in a circle at your campsite.) Be prepared for lots of inappropriate jokes and laughing while playing this adult game. Just try not to laugh too loud and wake up the kids! This camping game is something that teenagers could have fun with and even adults. It works this way: Place enough scraps of paper for the number of people in a bowl or cup, making sure that one has a star or the letter D on it, one other has a black dot or the letter M, while the rest are blank. The person who draws the star or D is the detective, and the person who picks the M or dot is the murderer. The rest of the players are potential victims. While the detective is looking for the murderer, the murderer will be winking at people to “kill” them without the detective noticing who did the winking. Once winked at, the “victim” may “die” for all to see. The game ends when the murderer kills everyone except the detective, or the detective figures out who the murderer is. Looking for simple, fun camping games for all ages? Try out this one. All you need is a phone with access to music or any other device that plays music. You can play this one several ways—a contest where each person does some dancing and everyone votes on which one was the best or silliest, a variation on freeze where people need to stop dancing when the music stops or just an all-out dance party to get the wiggles out. This final suggestion is our most calm and laid-back camping game, which might be perfect for kids or even adults or teenagers looking to relax after a busy morning of seeing the Byron Bay sights. Spread out a blanket in a shady spot (so you don’t have to squint so much!) but can still see up into the sky. Then you can play the alphabet game, looking for clouds shaped like something that starts with each letter or you can play “I Spy” on what the clouds look like or even just talk about what you see. Note: We suggest skipping board games. Lots of places might say to bring along games and have a family game night. However, we feel that it is way too easy to lose pieces or have parts blow away if you don’t have something on top of it. If you want to bring along games, we recommend card games. However, if you’re not going to be staying in tents but rather a camper, then board games could be an option if you’re playing inside. 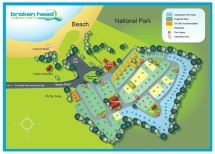 Bring your games and your family to Broken Head Holiday Park to enjoy your next camping holiday. Our beach location, combined with our quiet surroundings, make Broken Head an ideal location for your family camping holiday. You can take part in any of the many things to do in Byron Bay and then come back to your campsite to relax. We have powered and non-powered campsites as well as beach shacks, beach cabins and a beach house, so whatever way you like to do on your camping holiday, we’ve got you covered. I love this selection of games that the whole family can take part in when camping. Teens can be hard to please, but I feel a game like Murder In The Dark can whet their appetite for life and fun. Amazing selection of games. We’re going to try Some at our church camp! Thanks. We tried it and lol!! i love all these games, but i came to find more night time related games. can anyone suggest any?